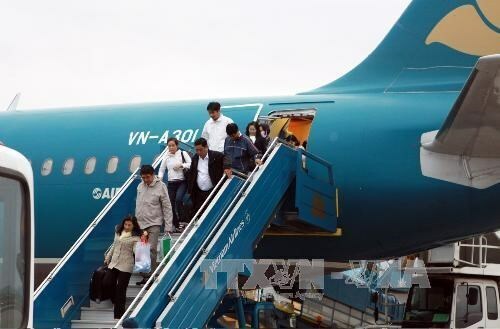 Hanoi (VNA) – Airports across the country served 55.41 million passengers in the period from January to July, according to the Civil Aviation Authority of Vietnam (CAAV). The total throughput in July alone was 9.11 million, a yearly increase of 12.2 percent, of which 2.34 million were international travellers (up 2.1 percent) and domestic ones 6.77 million (up 16.2 percent). At present, 63 foreign airlines of 25 countries and territories together with three domestic ones – Vietnam Airlines, Vietjet Air and Jetstar Pacific Airlines - are operating 105 international routes to and from Vietnam. In the domestic market, four local airlines - Vietnam Airlines, Vietjet Air, Jetstar Pacific Airlines and Vasco – are providing flights on 52 domestic routes. The Airport Corporation of Vietnam (ACV) have taken a series of measures to enhance the capacity of local airports, particularly those in the major cities of Hanoi, Ho Chi Minh City and Da Nang.